Price: $309 Credit, $303 Cash! $30 Shipping by UPS Air. 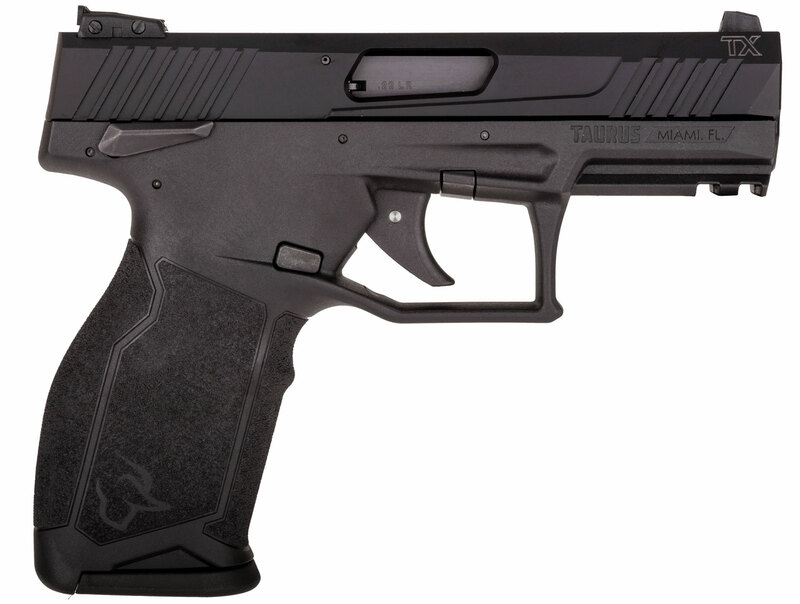 Taurus® continues delivering innovative handgun designs. 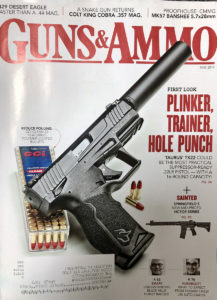 The TX22 is a.22LR suppressor-ready semi-auto that, out of the box, runs like a custom-tuned pistol but comes at a price point that puts a competition-level handgun squarely in the budget of the mainstream shooter. The “human factor” was integrated into every aspect of the TX22 development process, allowing ergonomics to set the design parameters. 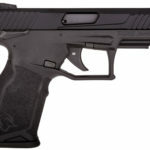 The result is a full-size polymer frame handgun that is both comfortable and functionally efficient for a broad range of shooter sizes and shooting styles. 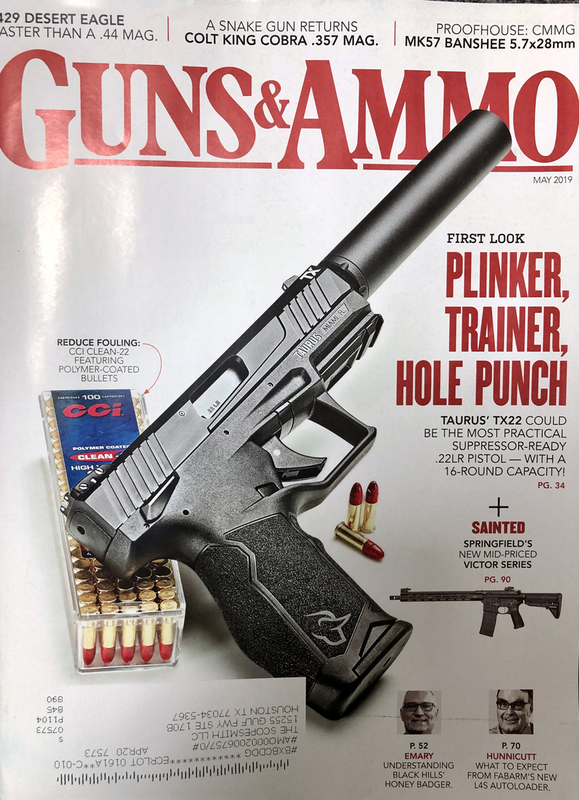 The short, smooth pull of its precision-designed Taurus Pittman Trigger System (PTS) utilizes a trigger reset that short and spring-assisted, allowing the shooter to deliver quick follow-up shots while maintaining good sight alignment. The audible trigger reset lets the shooter know once the sear is re-engaged and the TX22 is ready to fire the next round. The TX22 weighs 17.3 ounces, thanks in part to a 7075 aluminum slide that includes front and rear serrations and features a hard-coat black anodized finish. The comfortable grip and smooth operation combined with the .22LR chambering makes for a pistol that won’t wear you out during extended target sessions. In sum, the new Taurus TX22 design satisfies the needs of shooters of all sizes and experience levels without compromising in any area. This pistol meets the expectations of competitive-level shooters while providing the ideal platform for smaller-framed and beginning shooters—doing so at a viable price point that fits every budget. PLEASE CLICK MAIN PICTURES FOR MORE RESOLUTION! Features: Deluxe Altamont French Walnut Classic III stock. Stainless. Cold hammer-forged barrel is locked into the receiver by a unique, two-screw, V-block system. 1 in 16″ twist. Polished Stainless Steel. Features: Modular Stock. Fiber Optic sight. 3 Mags in stock. More fun than you can handle! Fits anywhere and is ready to go with fiber optics sights and four 10 round magazines (three stored in the stock)! Ruger’s 10/22 Takedown Backpacker features easy, quick separation of the barrel from the action for ease of transportation and storage. 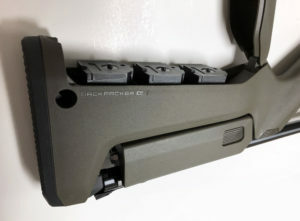 Simple reassembly allows for a secure connection of the barrel and action and returns the firearm to zero, even when receiver-mounted optics are used, ensuring consistent accuracy, shot after shot. The detachable 10-round rotary magazine features a unique rotor to separate cartridges and provide reliable feeding. Higher capacity magazines are available. The 10/22 has an easy-to-use extended magazine release that provides smooth, no-fuss removal of the flush-mounted magazine; push-button, cross-bolt manual safety; precision-rifled, cold hammer-forged barrel; fiber optic sights with an adjustable rear. The trigger housing assembly is precision-made of high-tech heat-stabilized, glass-filled, polymer for improved manufacturing tolerances, impact and abrasion-resistance, and unmatched ability to withstand the elements. his Takedown model features a Magpul Backpacker stock with an exclusive OD Green finish. It includes four 10-round BX-1 magazines (three in stock), and a combination scope base adapter for both Weaver-style and .22 tip-off scope mounts. FREE 100 ROUNDS OF CCI MINIGAG AMMO IF PURCHASED IN THE STORE! Features: Modular Stock. Fiber Optic sight. A great first rifle! Ruger new line of youth rifles provides small shooters a short length of pull platform (12.5 in) to start in the amazing sport of shooting with confidence. The modular nature of the stock allows it to be replaced by longer stocks in the future to be useful for a lifetime! 22 LR 16.1 inch barrel 1:16 twist. 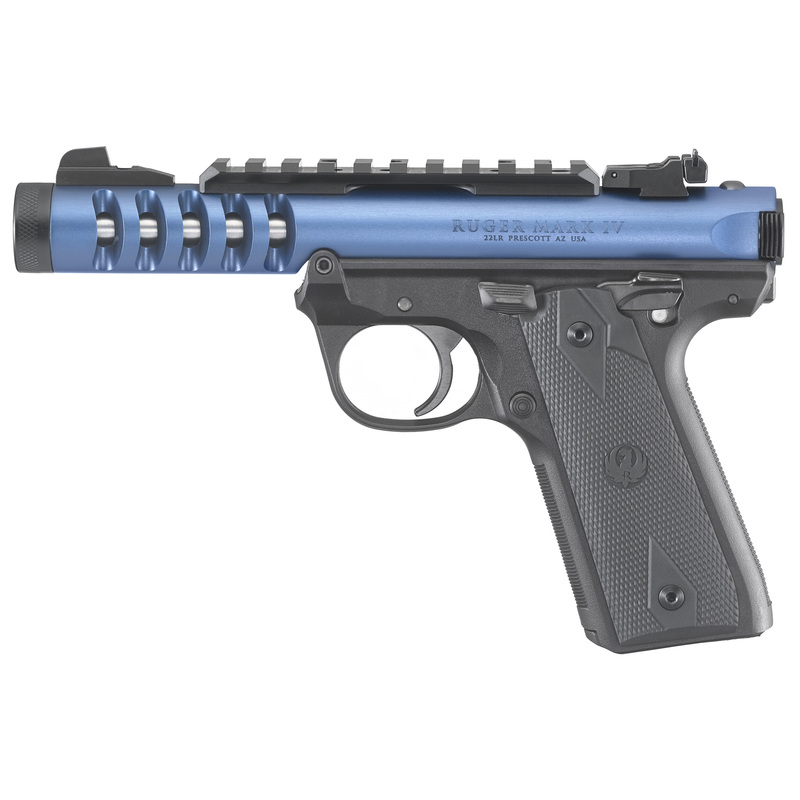 Ruger® Modular Stock System includes a low comb, compact length of pull module. Additional modules are available at ShopRuger.com. Patented, detachable 10-round rotary magazine features a unique rotor to separate cartridges and provide reliable feeding. Higher capacity magazines available. Fiber optic front with adjustable fiber optic rear sights. Ruger’s Mark IV features a simple, one-button takedown for quick and easy field-stripping and proper chamber to muzzle cleaning. The recessed button in the back of the frame allows the upper receiver to tilt up and off of the grip frame without the use of tools. 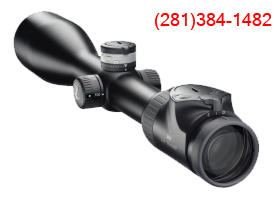 Its internal cylindrical bolt construction ensures permanent sight to barrel alignment, while the contoured ejection port and easy-to-grasp bolt ears allow for durable and reliable operation. The accurate sighting system features a drilled and tapped receiver for Weaver- or Picatinny-style rail. The Mark IV is a single action and utilizes an ambidextrous manual safety, push-button magazine release located on the left side, and an ergonomic bolt stop. Included is a washer and two magazines. 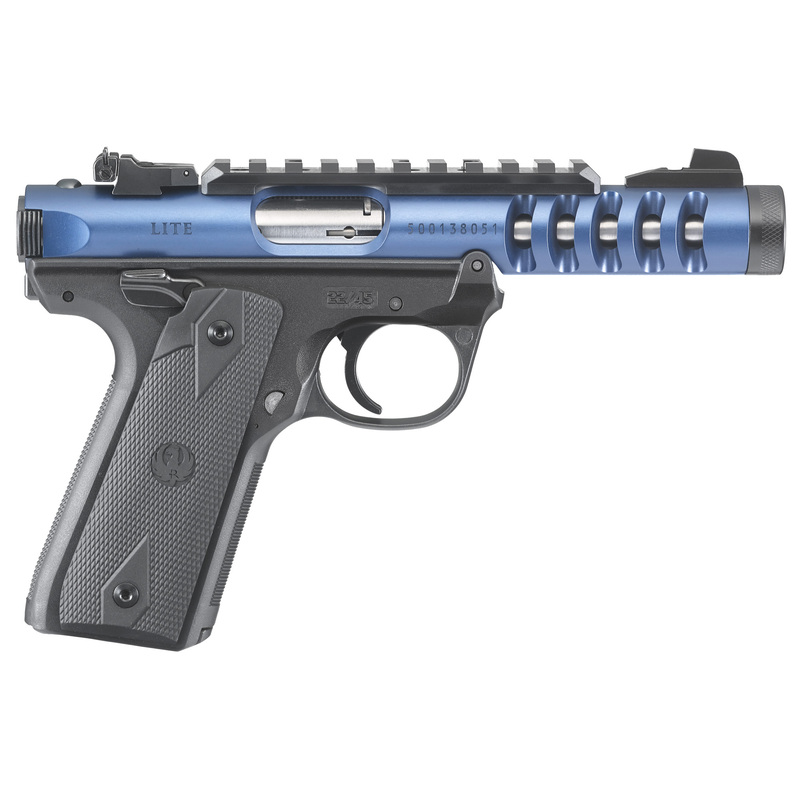 This limited 22/45 Lite model features an aerospace-grade aluminum, ventilated receiver with a blue anodized finish. It also has a 4.4″ threaded barrel, black polymer grip frame, checkered 1911-style grip, and a fixed front sight with an adjustable rear.